To see the official rules for Twenty-Nine Reasons to Love Rose Gardner, go here. Are you ready? We are! We have spent the last few weeks brainstorming, making lists, laughing, shopping, and scheduling our big month of giveaways, so without further ado we begin our Twenty-Nine Reasons to Love Rose Gardner. Call your friends and schedule a night in on the couch. 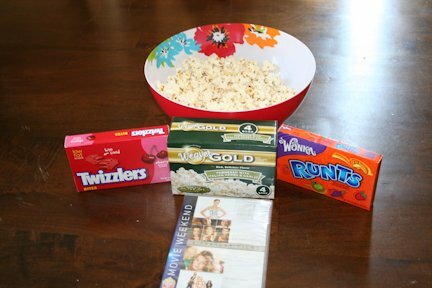 Today’s giveaway is a collection of must-haves for a great movie night. We’ll supply you with the popcorn, (Barbeque flavored– because we love all things southern!) the candy, a beautiful snack bowl and four great chick-flicks to choose from on one DVD. To carry our southern theme- Hope Floats (yummmmm Harry Connick, Jr.) 27 Dresses, Family Stone and In Her Shoes. Leave a comment below and if you feel like it, tell us your favorite southern movie. The contest will close Sunday night, June 17 at midnight CST. This day is now closed. The winner was Laura, #19! The Man in the Moon!!!! Sweet home Alabama but I do love Sandra bulloch in hope floats. Definitely a toss up between Sweet Home Alabama and Hope Floats. Sweet Home Alabama!! I watch it do much my kids complain and leave my room. Fried Green Tomatoes… For sure!!! Hmmm…definitely Steel Magnolias. But Fried Green Tomatoes is a close second. Steel Magnolias without a doubt! I love it! Your Comments -Sorry to be on here twice. My comments didn’t post. I like Steel Magnolias because of the tough ole’ ladies. My goal for my waning years. And why do I have the fat posting avatar? If there is a camera on this computer, I need to get dressed and comb my hair! Steel Magnolias! Where the Heart Is! Fried Green Tomatoes! I love the scene in the parking lot and the run in (get it?) between Kathy Baker and the 2 young girls!! There are sooo many! My first thought was Sweet Home Alabama, but I never pass up the chance to watch Forrest Gump either! What a splendid, fun idea! Congrats on the upcoming release. I need to get caught up and read 28 1/2 Wishes before 29 1/2 Reasons comes out. Southern movies…hard to pick one. My all-time fave…Gone with the Wind. I loved, loved, loved The Divine Secrets of the Ya-Ya Sisterhood. 27 Dresses was great, as was Sweet Home Alabama. Steel Magnolias! Without a doubt. Forrest Gump, perfect blend of laughter and tears. Sweet Home Alabama or The Notebook! And this reminds me, I’ve really got to watch The Blindside! THIS DAY IS NOW CLOSED. Random.org picked #19 so the winner is LAURA!!! We’ll send you an email to get your address and get this mailed out Monday!